This product is currently sold out due to a spike in demand in January 2019. New stock is expected to arrive in April 2019. We apologise for any inconvenience. 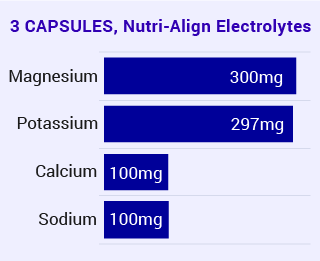 Nutri-Align Electrolytes come in a compact, easy to swallow capsule. Potassium, magnesium, and calcium ingredients are sourced from citrates for optimal absorption. We calibrated the dosages carefully to provide optimal nutritional support on your low-carb or Keto diet while avoiding potential side effects. Low-carb diets – especially ketogenic plans like Atkins and Keto – accelerate water loss. Glycogen is stored by the body together with water (three parts of water per one part of glycogen). Cutting out carbs from your diet forces your body to use up stored glycogen, also getting rid of the stored water. This water loss leads to electrolyte depletion. 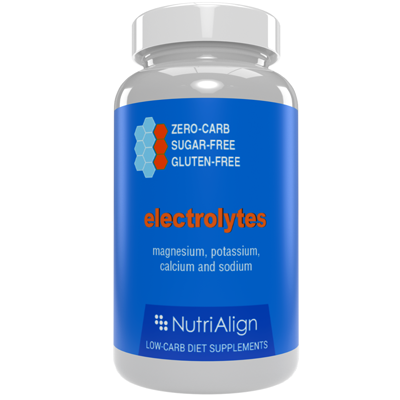 Electrolytes are essential minerals that conduct electrical impulses in the body. They are vital for the normal healthy functioning of your body. Low-carb dieters are advised to supplement electrolytes, especially in the very beginning of their diets. Supplementation helps to reduce Keto flu symptoms and ensures a trouble-free transition to ketosis. Depending on your diet and lifestyle, you may want to continue taking supplements throughout your diet, if any of the symptoms above persist. Take three capsules a day, preferably one with each meal. 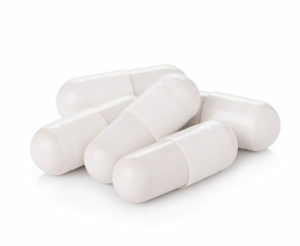 If Keto flu symptoms occur, take one capsule at a time – up to three a day.